When you want a savory, delicious, melt-in-your-mouth meal and you happen to be visiting Epcot, there is no better place for you to go than Les Chefs de France. 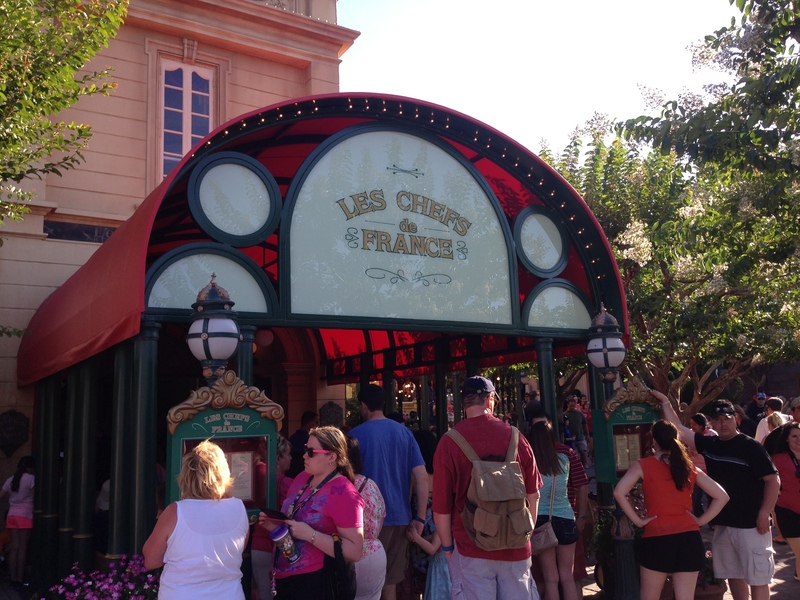 Located in the France Pavilion as part of the World Showcase, Les Chefs de France is a high-quality restaurant that pairs charming ambiance with sophisticated food. There are so many good things to eat at this restaurant that it’s hard to single out any particular thing they do well. The chocolate mousse was my favorite, but only because I absolutely love chocolate mousse and this was among the best I’ve ever had. It was rich, creamy, and full of chocolate flavor and the little cake that came with it was the perfect accompaniment to a well-crafted dessert. But before we get to the end, we should go back to the beginning. I ordered the prix fixe menu which for under $40 allows you to choose an appetizer, a main course, and any dessert of your choosing. Love that last part. 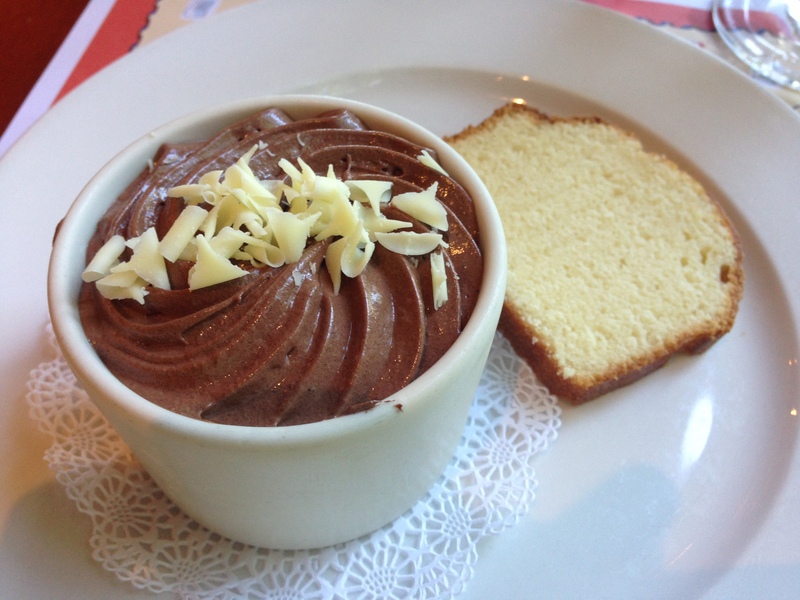 Course 3: Dessert – chocolate mousse! 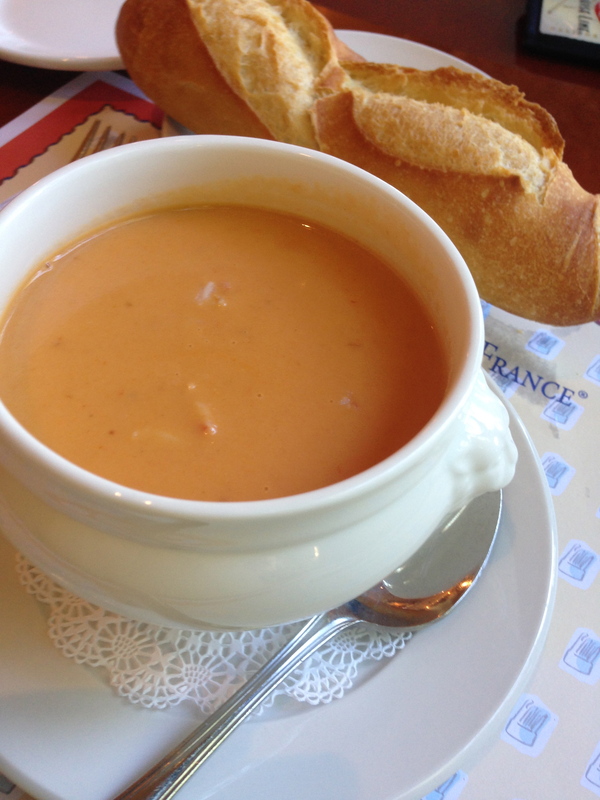 To open, I chose the lobster bisque. The soup was creamy, tasty, and smooth. It was exactly what I expected from a good lobster bisque. I would love if they had more lobster in it, but that’s because I like lobster. It came with a baguette of French bread (which they probably just call bread). The bread was tough on the outside and soft on the inside. It was hot and fresh when they brought it to the table. After polishing off the soup it was time for the main course. I chose the beef short ribs that were braised in Cabernet and served with a slice of polenta (and carrots and yes even they tasted good). 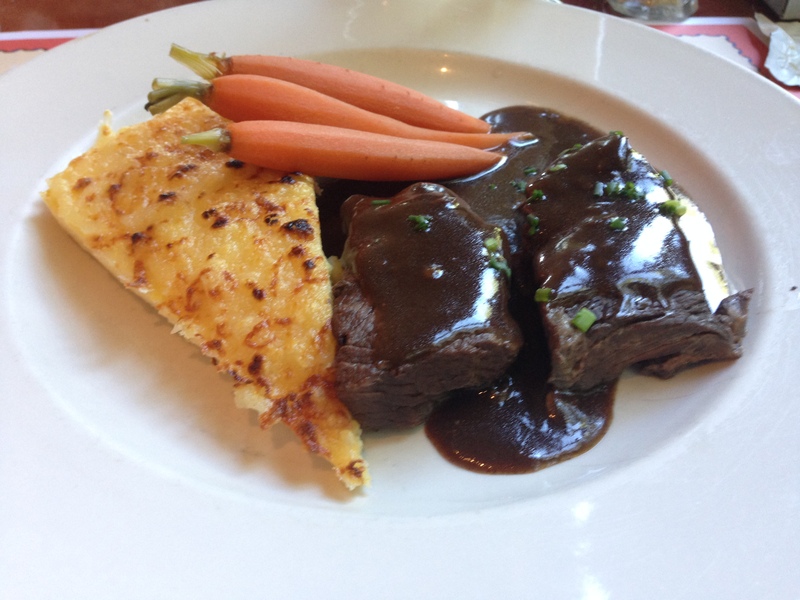 The Cabernet sauce was rich and brought out the natural flavor of the short ribs. The ribs were tender and could be eaten without a knife. The polenta was the only thing that didn’t blow me out of my socks but it still tasted good. To end the meal was the chocolate mousse. Now I’ve had really good chocolate mousse before, but this was so rich and flavorful with the slivers of white chocolate on top. Wow. What a perfect way to end the meal. There is so much to choose from. The menu includes other meat dishes, fish dishes, vegetarian choices, and great appetizers. There is always a fresh selection of desserts as well. All classic French dishes. You can’t go wrong here. If you want a great meal at a reasonable price for what you get, come to Les Chefs de France.